Find the values of x, y and z. We also know that vertical angles are always congruent - they always have the same angle measure. This means that y must be 76 degrees. Now how do we find x and z? There's more than one way to find them. 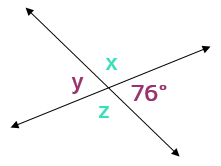 The fastest way is to use the fact that angle x and the angle marked as 76 degrees form a linear pair - they are right next to each other and form a straight line. This means that they must add up to 180 degrees. To find angle x, all we need to do is subtract 76 from 180. This means that x must be 180 - 76 = 104 degrees. 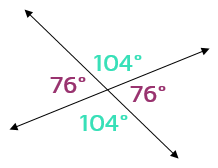 ​Now that we know x is 104 degrees, we know that z must also be 104 degrees because x and z are vertical angles. Vertical angles are always the same so if you find one. you automatically know the other one. No work involved! Now we know all the angles in the diagram. 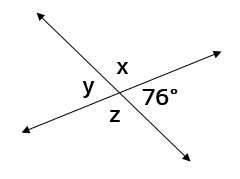 Anytime you have two intersecting lines, it will form two sets of congruent angles. As long as you know one of the angles, you can find all the others.